Koop Award Committee-meets-Sergeant Schultz « They Said What? Ever wonder why no one notices that wellness results are completely made up? Last year, the award went to British Petroleum. BP’s candidacy wasn’t exactly a longshot, since both its vendor (Staywell) and its consultant (Mercer) are on the Committee AND are “sponsors” of this volunteer committee. By the way, if you’re looking for any disclosure on the award announcement of those connections when you click through on the first sentence above, you’ll need x-ray vision, since there is none. No one seems to have noticed this omission. Besides not understanding ethics, apparently Mercer and Staywell don’t understand arithmetic: their “rigorous analysis” claimed almost $20,000/person in savings for active participants who reduced a risk factor. Besides being mathematically impossible, clinically laughable, unchecked for plausibility in violation of their own HERO guidelines, and not adjusted for dropouts and non-participants, this figure, as the screen shot below shows, is over 100 times more than Staywell itself says is possible. Once again, no one seems to have noticed this glaring contradiction. Ron Goetzel has written at length about Graco, as have we and others. By starting the measurement in 2009, the year after the program started (as opposed to starting the measurement two years before the program started — see the 2011 award winner, Eastman Chemical), and “forgetting” to count revenues added by an acquisition. Mr. Goetzel was able to tie the growth in Graco’s revenues to the “bottom line performance” of its wellness program. Of course, when you actually start measuring the year the program actually started (2008) — which coincidentally was also the year before the recession knocked 29% out of Graco’s revenues — and then adjust for the 2012 acquisition’s added revenues, Graco organically grew at about the same rate as everyone else. Wellness had nothing to do with it. Graco’s salespeople did not exceed their quotas because they ate more broccoli. 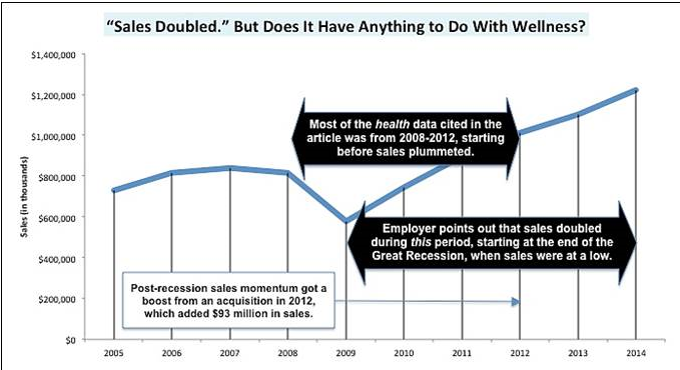 Here’s what else didn’t happen due to its wellness program: savings. 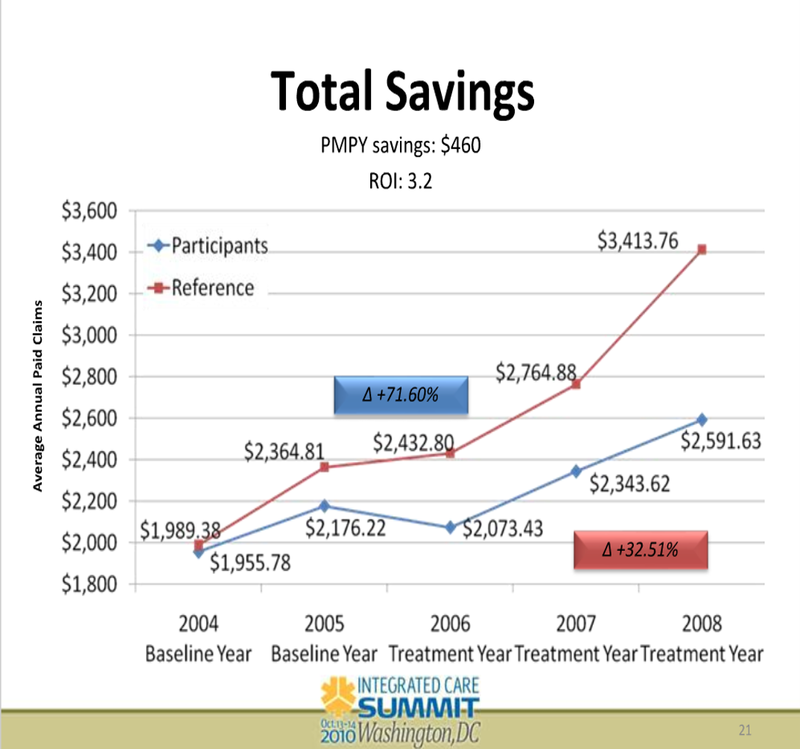 As our post showed, Mr. Goetzel didn’t notice that the cost trend for children (none of whom were in the wellness program) outperformed the cost trend for wellness participants. This means, of course, that the favorable trend among participants couldn’t be attributed to wellness, since the trend for a cohort without access to wellness was even more favorable. It’s all right here. Oh, yes, and it also turns out that Graco’s insistence on making its employees go to the doctor was more likely to harm them than benefit them. That’s not us–that’s the New England Journal of Medicine. We’ve already chronicled this one at length. There were quite a number of glaringly obvious rookie mistakes that escaped the notice of the award committee, either due to incompetence or perhaps the fact that the state’s vendor, Health Fitness Corporation (HFC), was also a sponsor of the award. See if you can find that sponsorship disclosure in their press release “congratulating” the State and LL Bean (the other winner, also a customer of HFC). You’ll need an electron microscope to go with your x-ray vision. HFC actually admitted lying about saving the lives of cancer victims who as it turned out didn’t have cancer, but still got the award because, according to Ron Goetzel at the 2014 Datapalooza conference, apparently this particular lie didn’t count because it wasn’t on their application, just everywhere else. It was impossible to miss, but Ron said he didn’t notice. Is this a great country or what? Another HFC customer. (HFC is really getting its money’s worth out of its sponsorship.) This was the one where — unlike 2013’s Graco, which started measuring outcomes the year after the program started in order to maximize the results — HFC started measuring outcomes two years before the program started in order to maximize the results. They separated participants and non-participants in 2004 but didn’t start the program until 2006. 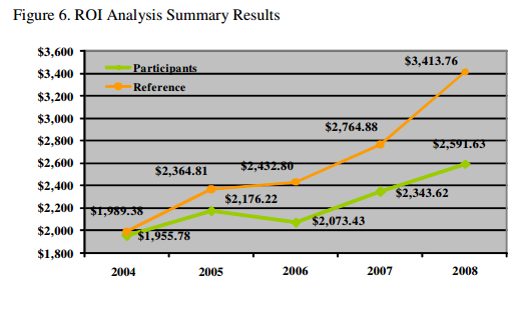 By 2005 the would-be “participants” were already 9% ahead…and by the time the program got underway in 2006, they were almost 20% lower-cost than the non-participants. Read that carefully. If it’s hard to read, here is the source. It’s towards the bottom. 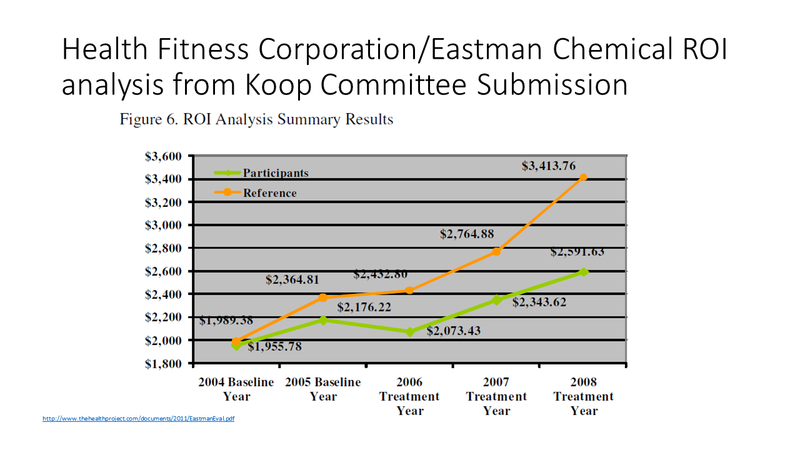 He says this slide and other data “convinced” the Koop Committee to give them an award. That’s his story and he’s sticking to it. His explanation didn’t indicate who mislabeled this slide, why he didn’t notice until now, why he snuck into the old files to relabel it, what the labels should have read — or why HFC never apologized, as others outside the wellness industry do when mistakes are made. None of Pfizer’s outcomes figures stand up to even the slightest scrutiny, and Mercer did the analysis — making Pfizer a shoo-in for this award. By their own admission only 4% of people moved out of high-risk status. (Naturally this tally excludes non-participants and dropouts, who likely increased risk factors at a faster rate than participants reduced them.) In other words out of 30,000 employees, 1200 reduced a risk factor. And yet somehow Pfizer saved $9.4 million, almost $9000 per risk factor. So if everyone at Pfizer reduced a risk factor, they’d easily wipe out all their healthcare spending. They did some secure messaging, but only about a quarter of the at-risk population even opened their messages…and only about a quarter of them clicked through to the messaging. Smokers self-reported at 6% before the program and 3% after it. No one hazarded a guess that perhaps some employees were, oh, I dunno, lying? However, no one can accuse Pfizer of lying about their weight loss results. In particular check out this comparison, which was offered with a straight face, of employees who read their weight-loss messages vs. employees who didn’t. Over the course of the study, people who didn’t read their messages gained 1.6 ounces while employees who did lost 2.9 ounces. You could practically attribute that differential performance to the calories required to open the emails. By whynobodybelievesthenumbers in Uncategorized, wellness doesn't work on September 8, 2015 . If you made this up no one would believe you. I notice when people respond (negatively) about you they never, ever criticize your analysis or conclusions. That’s the sign you’ve won on the facts, so your detractors will devolve to attacking your character. Like if you were nicer maybe you could ignore their errors?